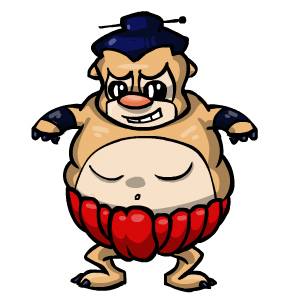 Sumo Sally is obese from living in Candyland. She likes to battle and lucky for her, all of the Candy and sugary, high fat food she eats here in Candyland has made her the perfect size for Sumo Wrestling. If you have a Sumo Sally Pass you can use play her quest game. She will pick a random Trading Card for you to battle and if you win the battle in time, she will reward you with BP and/or a Diamond for Elite Gym training. Earn 25% more MP from Simerian Explorer quests today. Changes at 00:00MST daily. Double Diamonds Giftbox and you will earn twice as many diamonds from Sumo Sally for life!